A Dollop of That! : Manali - An Ideal Yatra! Manali - An Ideal Yatra! The hustle bustle of a Metro like Mumbai coupled with its bumper to bumper traffic, long workdays and blink and you miss them weekends, call for some rest, and rejuvenation. Ensconced amongst the great Himalayan range in the state of Himachal Pradesh in India, lies a tiny little hill station known as Manali, located at a height of 2000 meters in the district of Kulu. A quick log in to Yatra.com ensured fast and easy flight bookings and we booked a weeklong round trip from Mumbai to Chandigarh and back a month in advance. An email to our travel agent for making an itinerary for the said trip, along with a taxi at our beck and call 24/7 really smoothened this trip for us, as a local taxi driver knew his way around the airport, the winding mountainous roads and beautiful places worth a visit. It was a pleasant autumn morning when my husband and I set off from our home in Mumbai to board a 2 hr 15 min Indigo Airline flight to Chandigarh. Once we landed at the airport we took a pre booked taxi and drove a whopping 7 hrs 30 mins to the charming hillock that is Manali. I must mention here that if hiring a taxi, please ask your travel agent to hire a taxi from the state of Himachal Pradesh only, as taxis from other states are discouraged by their strong taxi union which strongly opposes non-locals. Albeit a long journey, the road from Chandigarh to Manali threw at us one the most magnificent views of the Himalayas and the valley in their lap, coupled with now you see it now you don't glimpses of the Beas river. The long journey did end (although it often seemed it wouldn't, with my husband stating 'I'm not taking a vacation to the mountains ever again') and our taxi came to a halt at the magnificent Club Mahindra Resort, Manali. I must mention here that my very kind neighbours had allowed us to use their Club Mahindra membership as guests for that year, and all I can say is we couldn't have been luckier. 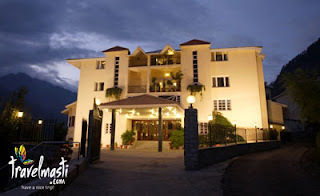 The resort has the most lovely views of of snow capped Himalayas on all sides along with wonderful service and lip smacking food. The first day was spent crashing on the gigantic beds and drifting off into deep, sweet slumber. Manali is a popular tourist destination, and has an enviable selection of outdoor sports activities like para gliding, river rafting, gliding etc. However we aren't the thrill seeking couple and prefer lazy relaxed holidays along with a little shopping and lots of picture clicking from my end. Hence we spent Day 2 driving up to the foot of the Rohtang Pass at Snow Point (this was the very first time I ever saw snow, and went a little too gaga over it). I even made a little snowman. The rest of the day was spent by me grinning from ear to ear thanks to the snow spotting and the other half working off his tush on his laptop. Day 3: Waking up to a chirpy little mountain bird outside your window is a lovely thing, followed by a sumptuous buffet breakfast and silently giggling at a throes of honeymooners, wondering why the women were decked to the nines on vacation. Post brekky we headed off to the charmingly delightful Great Himalayan National Park with is beautiful flora and fauna, the photographer in me went a little too crazy. Housed in the heart of the park is the lovely Hadimba Temple built in the 15th century its surrounded by Cedar trees which adds to its earth appeal. Personally I found it a bit too gory, with evidences blood sacrifices being offered to the deity in days of yore. The rest of the day was spent relaxing and playing indoor games at the hotel. Day 4: By far my most favourite as I actually went down to the river Beas, sat on its little rocks and enjoyed the soothing sounds as clear beautiful waters gushed through my fingertips. Sometimes if I'm having a more than tiring day I simply shut my eyes for a few moments and imagine that I'm time transported back to that day, when the calming water of the Beas made heavenly music, and the surrounding sights of little town houses, snowy mountains and miles of untouched forests filled my soul with serenity and gratitude. Day 5: We left post breakfast for Shimla (a six and a half drive again this. ), however I'm saddened to report that the old charm of the beautiful town is lost to commercialisation. Shimla is not a place I would like to visit again. Day 7: That splendid taxi ride back to Mohali Airport, Chandigarh where we boarded our flight back to Mumbai. Manali is a nature lover's delight and photographer's joy and if like me you tick mark on both of the above, do go there atleast once in your life. I promise your soul will be the happiest that it has ever been.